IF you are a professional building services planner, designer or contractor and you are tired of having drawings and calculations separated without an intelligent interface? IF you want to use the drawing’s geometry directly for your calculations? IF you want a software which automatically updates your drawing based on the calculation results? IF you want to have a review of your drawings that highlights "drawing errors"? IF you want automatic labelling and room stamps with all the relevant information? You have been waiting for GBIS. The intelligent connection between drawing and calculation software. What is the GBIS concept? 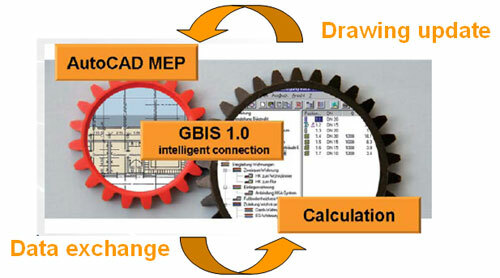 GBIS connects AutoCAD MEP with SOLAR-COMPUTER calculation programs for buildings and systems in an intelligent way. GBIS creates SOLAR-COMPUTER toolboxes in the user interface of AutoCAD MEP, checks drawings for "incalculable drawing errors" and prepares drawing data for calculation purposes. The real advantage, however, is the integration of the calculation results in form of automated data updates, labels or dimensional adjustments in the drawings. 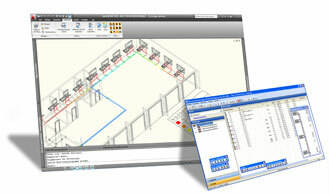 Moreover, GBIS provides throughout all calculations, for the visualisation of rooms, radiators, pipe work, etc. "GBIS" stands for "Green Building Information System". In the background, it saves any linked data for comfortable and efficient working throughout all consultation, planning and implementation phases. GBIS allows intuitive working as GBIS mirrors the most common workflow of its users while reducing required operation to a minimum. The calculation processes, that are highly complex are being processed in the background and are not visible for the user; why should they? "Visualising in AutoCAD MEP what is being calculated simultaneously in SOLAR-COMPUTER software" is another important feature of the GBIS concept. This simplifies the work and makes some searches in project data redundant. ... is automatically completed by GBIS, e.g. setting room stamps, labelling pipes or adjusting radiators to the required dimensions of the design; from the first planning stages throughout all subsequent revisions and changes. If there is an internet connection, information on the GBIS current version used and up-to-date topics with reference to GBIS are available to the user. Just click on the SOLAR-COMPUTER logo in the GBIS toolbox.